Barn fires cause immense suffering, killing hundreds of thousands of farm animals every year. Some farm animals die almost immediately as fires burn through the barns, while others have to be euthanized later due to severe burns and smoke inhalation. The Animal Welfare Institute released a report in October 2018, compiling information on the prevalence and causes of farm animal deaths due to barn fires during the preceding five-year period (2013–2017). 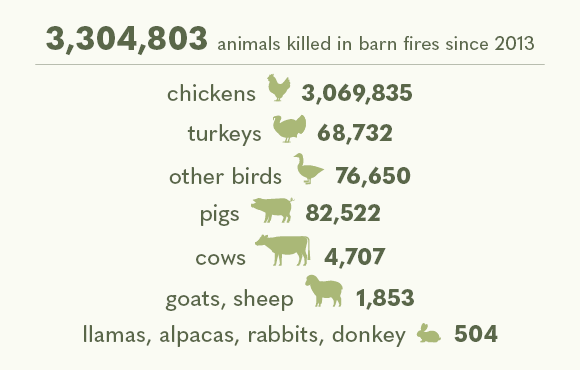 During those years, over 2.7 million farm animals perished in barn fires. Ninety-five percent of those deaths were chickens. In just one October 2017 incident, a staggering 1 million chickens were killed in a single fire in Indiana. Findings from the report suggest that the biggest risk factors for barn fires are malfunctioning heating devices and other kinds of electrical equipment. Almost 50 percent of barn fires that caused farm animal fatalities started due to heating lamps, space heaters, and other heating devices. This significant percentage suggests that this equipment should be frequently checked, repaired, and replaced. Most fatal barn fires occurred in colder states, particularly the Upper Midwest and the Northeast. New York, Pennsylvania, Michigan, Wisconsin, and Minnesota had the highest number of barn fires, respectively. The amount of cold weather a state experienced appeared to be a greater factor in the prevalence of barn fires than the intensity of a state’s animal agriculture production. Seeing that most barn fires that caused animal deaths were due to heating devices and occurred in colder states, it is not surprising that the majority of fatal barn fires happened during colder months when there is an increased need for heating devices to keep farm animals warm. Roughly three times as many barn fires occurred in winter (January through March) than during the summer (July through September). Click here to download a report of the 2018 barn fires.